In our last blog, we talked about how algae and debris can find its way into the drain lines of an HVAC system, clog, and cause flooding in the home. But, a clog in the system isn’t the only way a flood can result from an HVAC operation. A failed condensate pump will allow condensation to build up and cause a flood in the home, too. 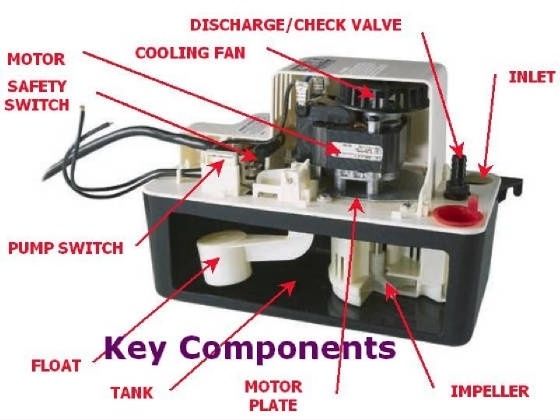 A condensate pump is comprised of the top, which contains all the working components, and the bottom, which is merely a reservoir for the collected water. The top has some things running to and from it: the wiring, the discharge valve and hose, the casing for the motor, and the inlet port. There is also another port through which the reservoir bottom is visible. A handy person can unplug the pump, disconnect the intake and drain line, and use a flathead screwdriver to open the unit at the slot on the side between the two pieces and look inside. There are a few things to look for in the pump. The reservoir may have some dirt, algae, and debris inside. Sometimes there will even be a dead mouse or lizard. The gunk should all be cleaned out. In fact, proper cleaning of your pump can extend its life significantly, so it’s worthwhile to do so. The water float, which gauges the amount of water and relays the level to the pump to signal it to turn on. The float should move freely. The impeller basket, a round columnar shape with slots, should be clean and debris-free. The discharge valve should also be clean and can be removed and cleaned with a cotton swab or a small bristle cleaner. Once the unit is clean, it should be returned to its rightful place and reconnected. Don’t forget to plug it back in; failure to do so will result in a flood once the reservoir fills up. A little water can be added to the reservoir to test the pump and make sure it’s working. Once the pump is cleaned and reconnected, the air intake filter should be replaced. As with any appliance, a little maintenance goes a long way. These types of pumps only cost about $40, but since they run off and on all the time, it’s a good idea to keep them clean and in good working order. A homeowner will want the pump to last as long as possible since unit failure will result in the need to shut the HVAC off until the pump can be repaired or replaced. One note of caution: since these pumps run off of 120-volt power, it’s important to be very careful working around them if they’re turned on, and also, make sure that they’re plugged into a GFCI switch. As always, home maintenance should be conducted with safety in mind and at your own risk. For a modest fee, we can do it for you and check the rest of your system, too!